Most of the time, we choose a restaurant of my long wish list. This time, we didn’t want to wait for a seat at plan A, so we chose chose one near by. We lucked out having spotted the little yellow awning of Sandro’s 306 East 81st Street, New York, NY 10028 off the main street. Something drew us to this plain white space, a less generic look than what we were seeing on Second Avenue. 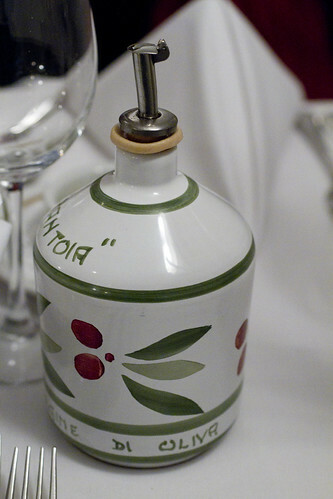 The strong Italian accents bounce between the narrow length, noises of bustling, and forks happily hitting plates. We got the sense that Sandro’s has it’s local patrons (tables were almost full), yet most of the city has yet to discover this fine gem. We were enticed by most of the menu and then specials were announced with ample descriptions. A light bruschetta was dropped off for us to enjoy. 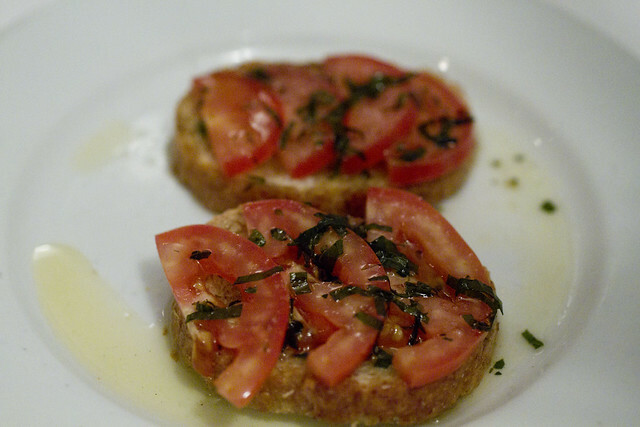 Crisp toast topped with thinly sliced tomato and basil and a generous drizzling of their excellent olive oil. Though the tomatoes were average, it was a refreshing moment. It didn’t take long for our sepia appetizer to arrive. 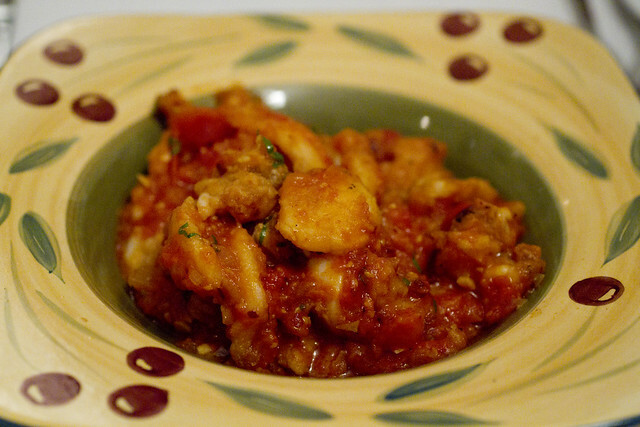 These were wonderfully tender bites of cuttlefish, fried with a light batter, then tossed in a moderately spicy tomato sauce. The portion is really enough for four to share as an appetizer. We debated over and over again whether to eat more or allow room for our entrees. We ended up eating most of it. Since we always share, we chose one pasta and one meat dish. 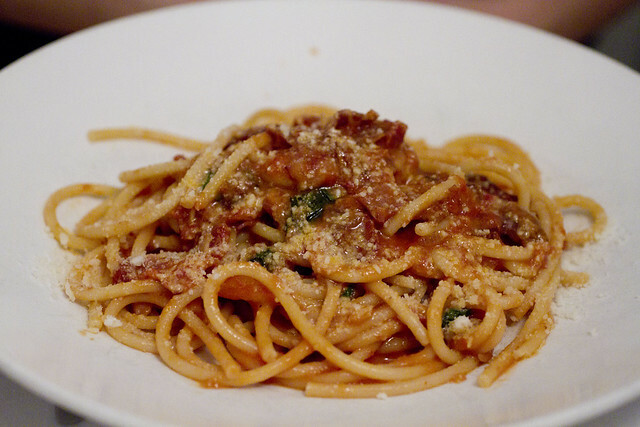 The Bucatini Amatriciana is their signature dish. The pasta is perfectly al dente but it was a tad over-sauced and quite salty. 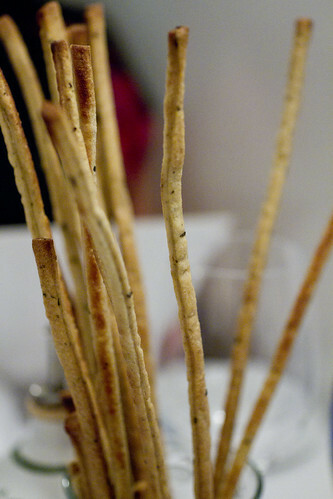 The cheese used also seemed to overpower the rest of the flavors. 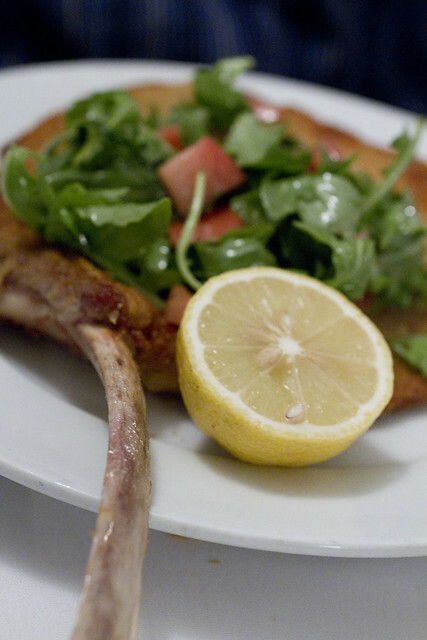 A special that night was veal cutlet on the bone, pounded thin, fried, and topped with a salad of tomato and arugula. This dish is the ultimate lesson in simple done well. Leaving the bone on is an excellent presentation choice while the salad not only adds color, but a fresh counterpoint for fried meat. I would love to know their secret for the most tender veal we’ve ever had. Perhaps a marinade or a firm beating? Whatever it was, we were able to cut through effortlessly with a butter knife. The entree portions were big as well and we ended up with a lot of left-overs that made great lunches on following days. I added more pasta to soak up sauce and the veal cutlet became sandwiches. With tax and tip, it came out to $110.10, completely reasonable for a nice date night or small family gathering. We intend to come back with more mouths to eat these hefty portions. posted by jessica	at 06:19 PM	Filed under Favorites, Italian, Restaurants. You can follow any responses to this entry through the RSS 2.0 feed. Both comments and pings are currently closed. How come you say the portions are so big when they look so tiny in your pictures?? eatingfoodboy, the plates used are large so I guess without a point of reference, you can’t really tell how big the food is. Just to give you an idea, the veal cutlet was roughly a 9″ round.